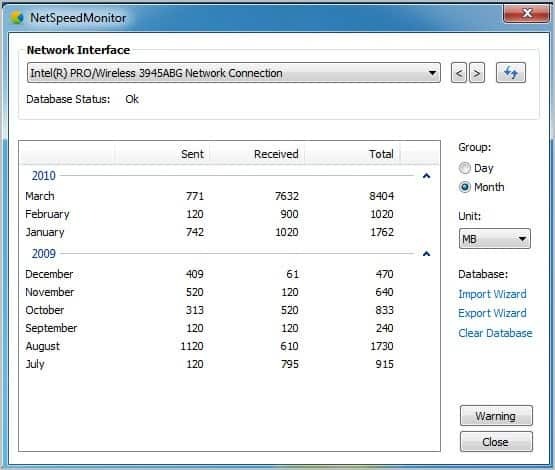 NetSpeedMonitor is a free program for Microsoft Windows that displays the speed of incoming and outgoing network traffic and bandwidth use for the month, day and session in the Windows taskbar. Sometimes you may want to display information about your Internet connection right on the desktop, for instance to test the speed of a new dedicated server that you just rented, or to make sure that you are uploading or downloading at full speed. Having direct access to realtime stats can also be helpful if you are troubleshooting a particular connection, for example, after noticing that the video uses a lower quality than usual, or if the Steam download is nothing but a trickle of what it could be. We have reviewed programs in the past that display the network traffic in the taskbar and on the desktop, with Net Traffic being one of them. NetSpeedMonitor is another professionally looking option for the Windows operating system. Inlike Net Traffic, it does display the upload and download speed right on the taskbar. The program is compatible with all recent 32-bit and 64-bit versions of the Microsoft Windows operating system. The network monitor keeps a history of the network adapter's upload and download speed. You can disable that during setup and later on in the options, which you may want to do if you are only interested in realtime connection speed information. The program displays the upload and download bandwidth in kbit per second. 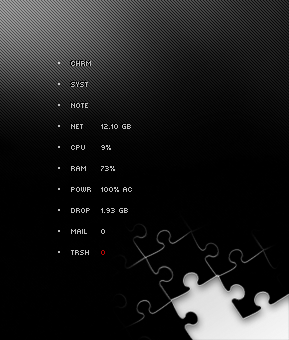 You can customize the layout in the program options. Here it is possible to change the font type and size, rendering, prefixes, and the bitrate among other things. The traffic history can be used to check a system's monthly bandwidth utilization which can be useful to check that you did not hit bandwidth caps or to troubleshoot recurring issues with the Internet connection. A data traffic menu is activated if traffic is logged on the system; it details sent, received and total traffic per day or month. The data is populated automatically when the program is running, and monitoring is enabled. Monitoring can be turned off, which can be useful if you are working with a laptop in multiple locations and do only want to monitor traffic in some locations. 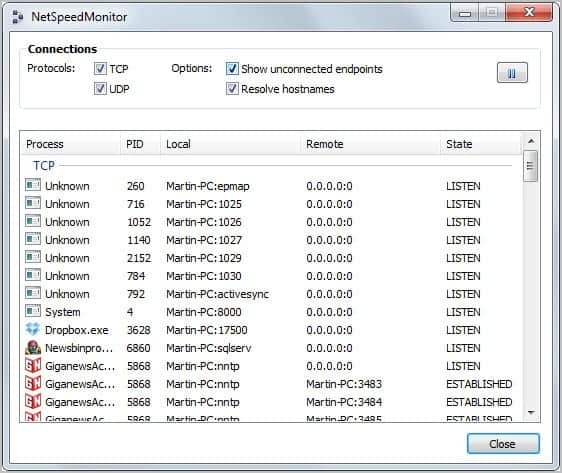 NetSpeedMonitor can display the list of active connections in another program window. Here you see the process, local and remote IP as well as the state of the connection. Windows users who like to display realtime traffic information in their taskbar, and those who want to record the bandwidth utilization of their Internet connection, can download the latest version of NetSpeedMonitor from the developer website. from download sites as the program is no longer hosted on the developer website. NetSpeedMonitor is a useful program for Windows that displays network speed and other networking related information on the Windows taskbar so that it is always in view. Very interesting find! I currently use Network Meter v.8.1 by addgadget.com but I use a lot of programs in full screen mode on my laptop and I don’t have my gadgets to stay on top of windows (less distractions), but I would find it helpful to have something on the taskbar which is always in view, too bad they couldn’t make it a little more graphically pleasing then just numbers. How does it stack up to BitMeter? I love BitMeter except that it is a process hog from hell. You mean BitMeter2? BM2 seems more visual than this program, and it appears to offer additional information, like the average download and upload speed on a particular day, or the ability to notify you when you are near your monthly traffic quota. Good one, Martin. This is very useful. I use Rainmeter to display accumulating bandwidth(& a whole load of other info) usage which automatically zero’s again at the start of a month. I use all gadgets from Igor, IMO best monitoring gadgets out there. Dr.Igor’s system monitor gadgets have a very similar look to the gadgets over at addgadget.com, I wonder who copied who here….. This software is listed as beta level and has not been updated in nearly 2 years. I have been running it for 2 days now and comparing against Bitmeter2. I am noticing a large difference in the statistics. Right now, BM2 is telling me that I have downloaded 20MB today so far while NSM is showing 46MB! Quite a difference! I am sure you have BM2. Maybe you can run a test on your side and see if the figures match on your system? Just ran a test and both programs showed 512 Megabytes downloaded. Have you selected the same unit in both programs? Thanks for the post dear Martin. I totaly prefer and recommend everyone to use NetWorx. Yes, I was using the same units. Not sure what the measuring problem is (maybe the program doesn’t like XP)? I decided to remove it anyway since I auto-hide my taskbar and wouldn’t be able to see it. I keep a small Bitmeter2 window in the lower left of my monitor and that has served me well to show me when something isn’t right. Courtney, a 32-bit and 64-bit version is available. We have updated the link to reflect the option. You find downloads of both versions on the download site. Possibly unrelated but NetLimiter has quite a nice interface for Windows current traffic.